There is something so indulgent about foods that require you to eat with your hands. Touching your food creates a connection to it that appeals on some basic primitive level. 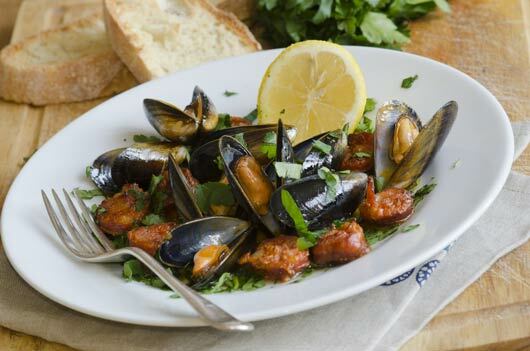 Sitting down to a big pot of mussels definitely gives this primal pleasure—all the more because searching each little shell is a little like a treasure hunt, which is rewarded with tender meaty bites. And the broth that accompanies them always tastes even better when scooped up along with the mussel and sipped out of the shell. This is one of my favorite bistro classics; however, there is no reason they should be reserved for dinners out, especially when you can have them fresher and cheaper at home. You’ll want to buy them as fresh as possible, but you can store them in the fridge for a couple of days before preparing if needed. Remember these little guys are alive and they need air, so don’t cover them up in a closed container. Instead store them in the refrigerator in a large bowl and place a damp towel over them. This will give them enough moisture and allow them to breathe. When you’re ready to cook them, the basic rule of thumb to weed out the bad ones—explained in more detail below—is that they should be tightly closed before cooking, and open after. Once you master trick of cleaning them, they’re remarkably easy to prepare and cook very quickly. Moreover, you can make countless variations to suit whatever mood you’re in. This version gets a nice kick of heat from Andouille sausages. In fact, the sausages give off so much flavor that you actually won’t need much else in the way of seasoning. Serve with a salad and crusty bread, over pasta, or with French fries for the full bistro effect. All I really need though, is a spoon to get every last bit of broth, and a bowl for the empty shells.